According to a recent study from the Johns Hopkins Institute for Education Policy, students from low-income backgrounds are not only less likely to complete college, but they are also more likely to attend colleges with lower graduation rates. Why is it that the students who arguably most need the odds to be in their favor are, perhaps unknowingly, making college choices that will affect their long-term ability to achieve their goals? The Hopkins paper, Family Income and the Completion Gap, points to three influencing factors: inadequate guidance during high school, lack of ongoing coaching during college, and a skills gap in developing success networks and social capital. So how can schools and higher education institutions help lower-income students plan for and achieve their college goals? Creating a college-going culture, even as early as elementary school, helps engage students in their education and link their strengths and day-to-day activities with their future goals and ambitions. Providing students of any socio-economic status with hope and inspiration combined with practical guidance on how to approach the college-search process can provide lifelong value. The Hopkins report also examines the need for continued coaching, support, and services once students from lower-income families enter college and points to two promising studies that appear to more effectively, and more cost-effectively, help these students succeed. The Hopkins paper also references another study conducted at Stanford, where researchers followed a group of students who were contacted by coaches regularly to help them overcome academic and social challenges, to develop clear goals, and connect their goals to daily activities. Those students who were randomly assigned to a coach were significantly more likely to still attend the university two years after the end of the program, including lower-income students who received Pell Grants and those who required remedial classes. The authors of the study found that these coaching programs were more effective and less costly than other programs. In a second study (also referenced in Family Income and the College Completion Gap), a group of researchers at the City University of New York (CUNY) found promising results in a research project called Accelerated Study in Associate Programs (ASAP), which is designed to help students graduate and do so quickly. ASAP participants from three community colleges were given additional supports, including advising, career services, tutoring, help with goal setting and study habits, tuition waivers to make up the difference between financial aid and tuition costs, free textbooks, and free access to public transportation. The ASAP program almost doubled graduation rates and increased the number of students enrolled in a four-year college by eight percentage points. Lack the direction needed to select a course of study that will meet their goals. Access to such resources and relationships provides advantages for navigating the many stages of the college experience—from learning about college options to selecting the right-fit programs and classes. According to 2008 research from Engle and Tinto, students from lower-income families are less likely to interact with faculty, belong to study groups, and join extra-curricular activities. This research reinforced that even those students who were academically prepared for college had not learned to access resources such as faculty and academic advising. Building social capital or support networks requires a full range of activities, from educating the student on members of their success network, the role each member plays, and an easy way to reach them on an ongoing basis. As shown in this research, providing additional support in the form of counseling and advising during key periods during students’ college-search and college-going experience can have a significant effect on the number of lower-income students who attend college. This kind of guidance may also help students chose institutions with higher graduation rates. Administrators at schools and higher education institutions will increasingly seek partnerships and resources to help deliver the guidance, coaching, and nudging required to engage students of lower socio-economic status. Addressing these challenges will require new partnerships, solutions, and further study. Hobsons is actively working with AASA (The Superintendents Association), Achieving the Dream (ATD), and the American Association of Community Colleges (AACC) to study issues that foster a college-going culture and affect student success. 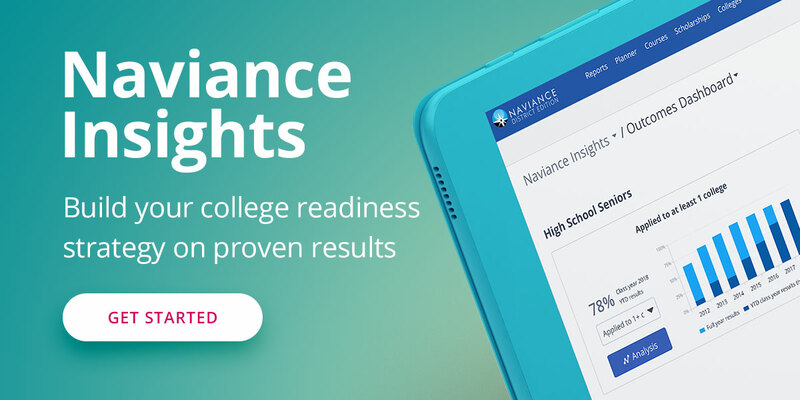 Solutions such as Naviance help schools and districts engage students in their academic journey at an early age and develop a college-going culture. Naviance has helped millions of students explore their strengths and link their passions to every-day activities. However, the work to engage students doesn’t stop at matriculation. Colleges and universities also need tools and resources to deliver the ongoing coaching and skill-building to help lower-income students develop success networks to help them overcome obstacles and foster positive, informed decision-making about programs of study, course sequencing, and college-life balance. Starfish by Hobsons helps lower-income students get the help they need to succeed – even when life happens. Contact us to learn more about how Hobsons can help with your student success efforts.